District and State Rally News! 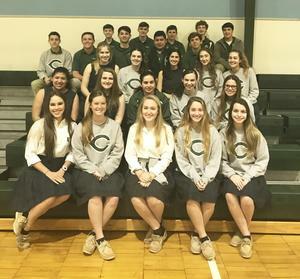 Select 8th-12th grade students at Catholic High of Pointe Coupee participated in the Regional District Rally. These students are selected by subject teachers, based on the student’s academic performance as well as interest in the subject. On February 23rd, students were given a written test and if they placed first or second in their subject, they qualified for State Rally which is held on April 6th at LSU. CHSPC was able to participate in 26 events at District with 27 participants qualifying for State Rally. The following students qualified for State Rally in their event: Andrew Trepagnier (Advanced Math-Pre-Calculus), Bryce Vielee (Algebra I), Cameron Decoteau (Algebra II), Brandon Riddle (Algebra II), Tyler Coursey (Biology), James Garrett (Biology II), Camryn Lamkin (Business Computer Applications), Julia LeJeune (Calculus I), Jenna Guidry (Chemistry), Madison Armand (Civics), Anna Vosburg (English I), Brooke Fairchild (English II), Maggie Peltier (English III), Emma Bates (English IV), Emily Cazayoux (Environmental Science), Omar Aguilar (Fine Arts Survey), Andrew Jewell (Geometry), Maria Aguilar (Health), Jake Eaves (Physical Science), Jenna Smith (Physics), Lanie LaCoste (Psychology), Olivia Beauvais (Sociology), Slate Perrault (Spanish I), Reese Morrison (Spanish II), Emily Major (Spanish III), Ryley Hopkins (U.S. History), Jenna LaCour (World Geography).